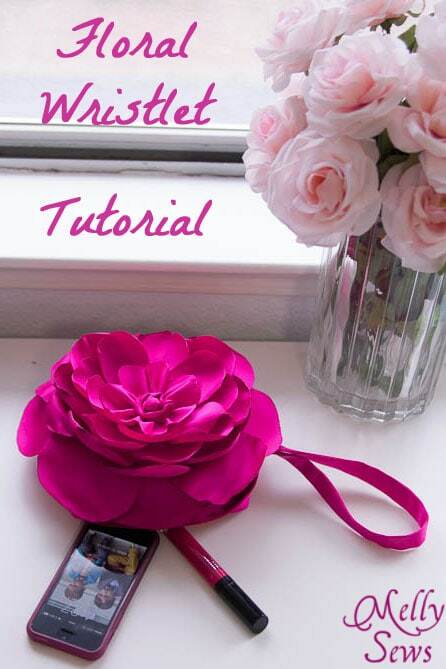 Would you be surprised if said my favorite part of making this floral clutch tutorial was that I got to play with fire? Also I’m thrilled with how it turned out, but mostly, playing with fire from the last candle I have from our Hawaiian vacation two years ago was cool. Approximately 1/2 yard of polyester satin. Make sure it’s polyester, and a heavier weight is better. 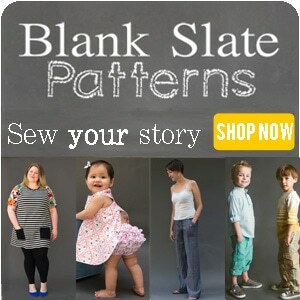 Start by printing the pattern and cutting it out of your fabric. PLEASE NOTE: there are not pattern pieces for the rectangular pieces, just measurements that print out on the top of page 2. Use these to cut out the additional pieces. Next you get to play with fire. LIght your candle, and put on some tunes. The take each petal (yup, all 32 of them) and one at a time hold the edges close to the heat. If you look closely, you’ll see the edges start to melt a little. This will prevent the petals from fraying. 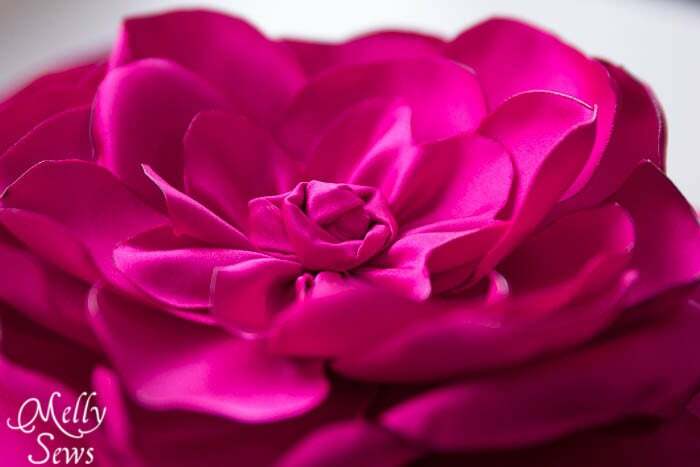 In addition, if you hold the petal in a curved shape as you heat the edge, it will cause the petal to become more three dimensional, like an actual flower petal. *IMPORTANT SAFETY NOTICE! Use caution near flame. Don’t burn yourself. Keep a fire extinguisher nearby. And don’t try this with a natural fiber – like silk or cotton – that will just burn instead of melt. Lay one of your circles right side up. Place 4 big petals on it as shown, then layer the next 4 big petals over those. 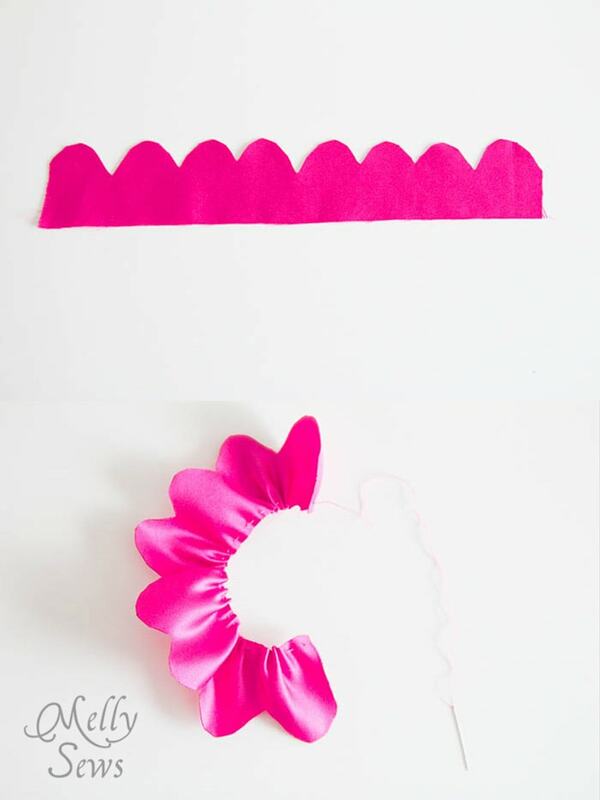 Sew around in a spiral shape to secure the petals to the circle. 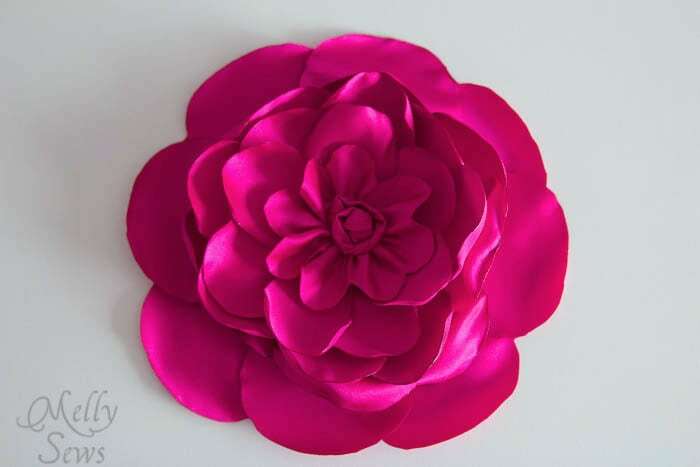 Repeat with the next smaller size petals, and the next, until you’ve sewn all 32 petals on. 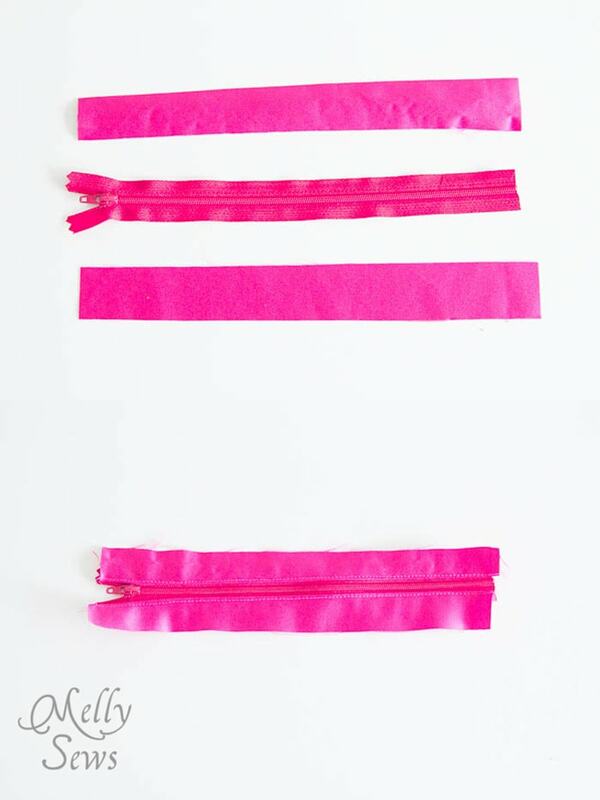 Take your 2″ wide by 10″ long strip of fabric and fold it in half 3 times. 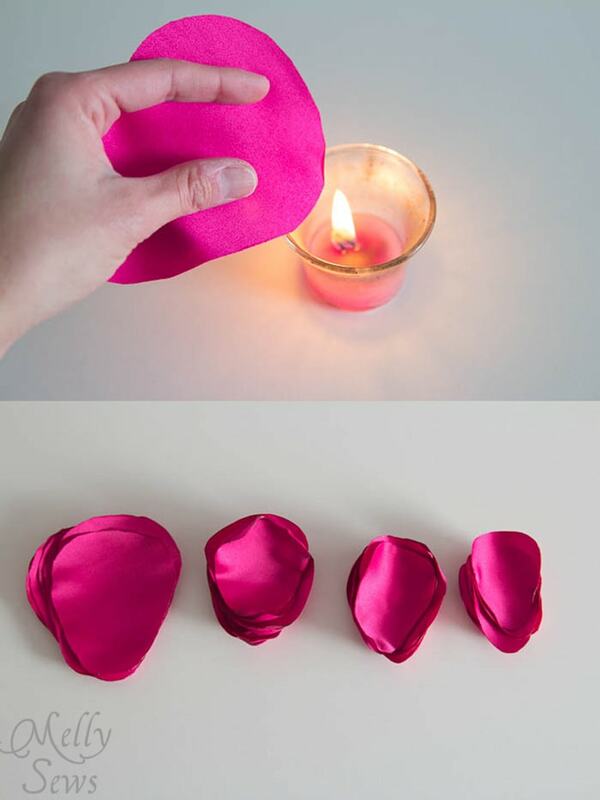 Cut a petal shape on one end and unfold. Heat all the edges of this fabric to stop fraying. Use a hand sewing needle to sew a gathering stitch along the straight long edge, then pull the thread to form a flower shape. 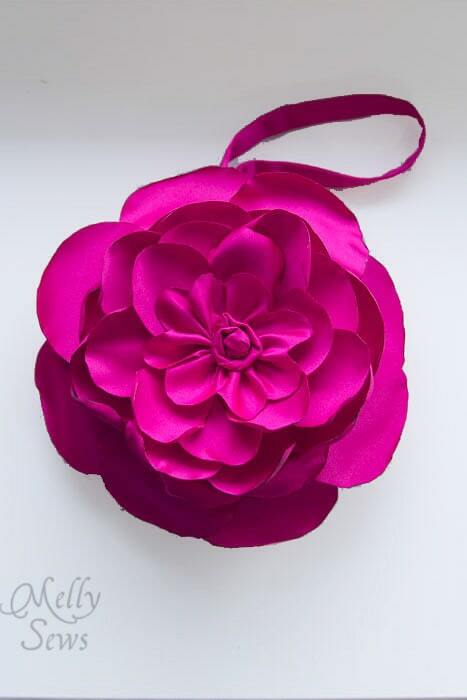 Hand stitch this into the center of your petals. 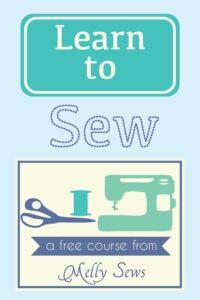 Sew your 1 1/2″ by 5″ strip into a tube, right sides together, matching long edges and using a 1/4″ seam. Turn tube right side out. Heat the ends of the tube to keep them from fraying. 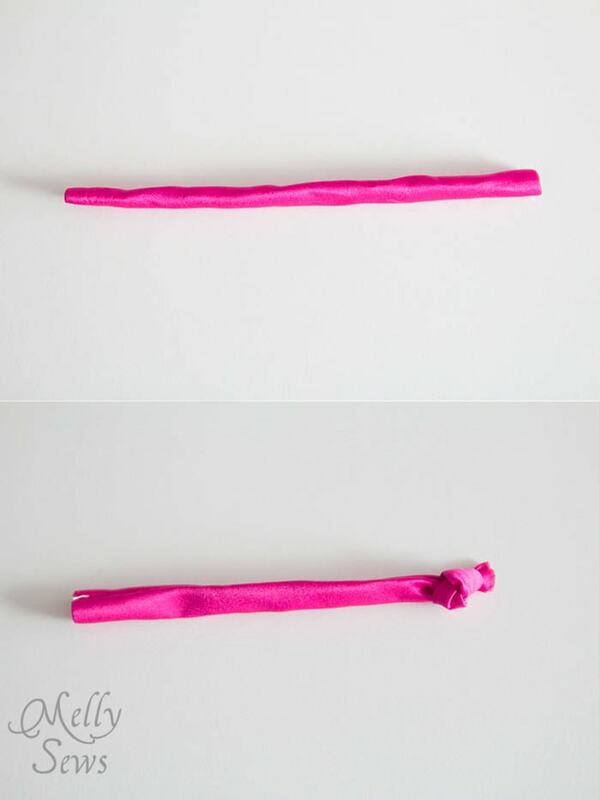 Tie a knot in one end of the tube, then wrap the other end around the knot to form the center of the flower. Hand stitch in place. Take the two 1 1/4 by 10 inch strips and sew them to either side of the zipper. Place one strip right sides together with the zipper, sew, and press, then repeat with the other strip. Take the 2 by 16 inch strip and press the short ends 1/4 inch to the wrong side. 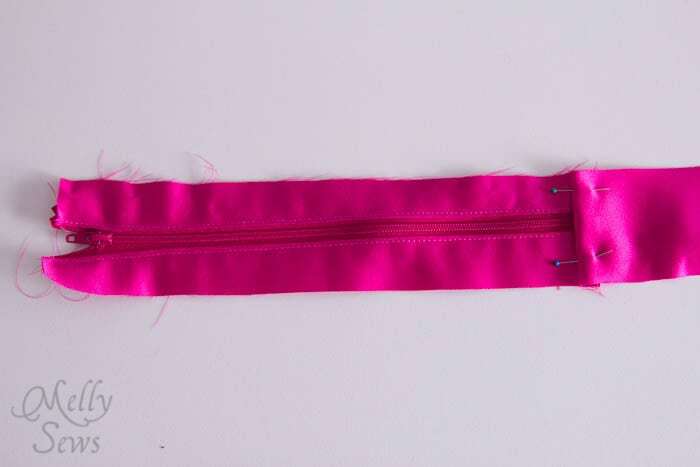 Lay one end over the bottom of the zipper and topstitch in place. 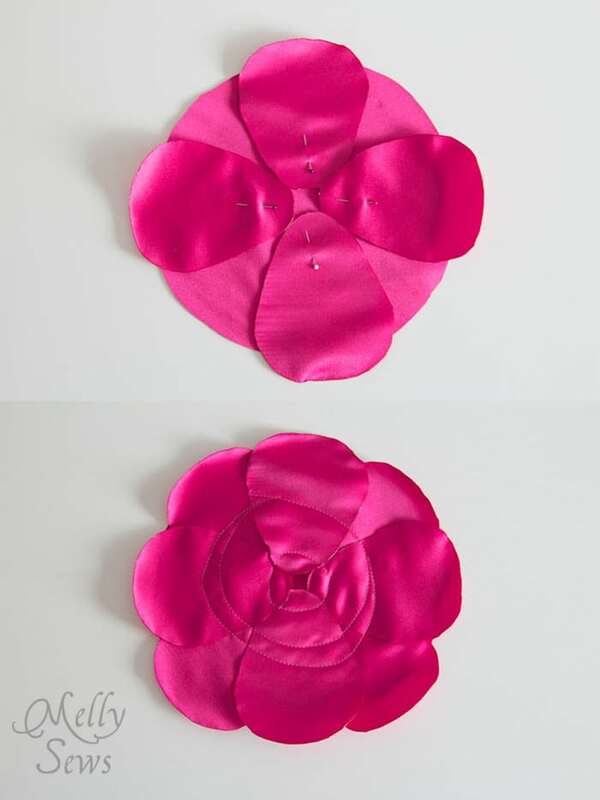 Pin the zipper band around the circle that doesn’t have petals attached. Adjust the fold on the open end of the band to cover the raw end of the zipper and fit the circle. Pin the band together at the short end. Stitch the band to the circle. 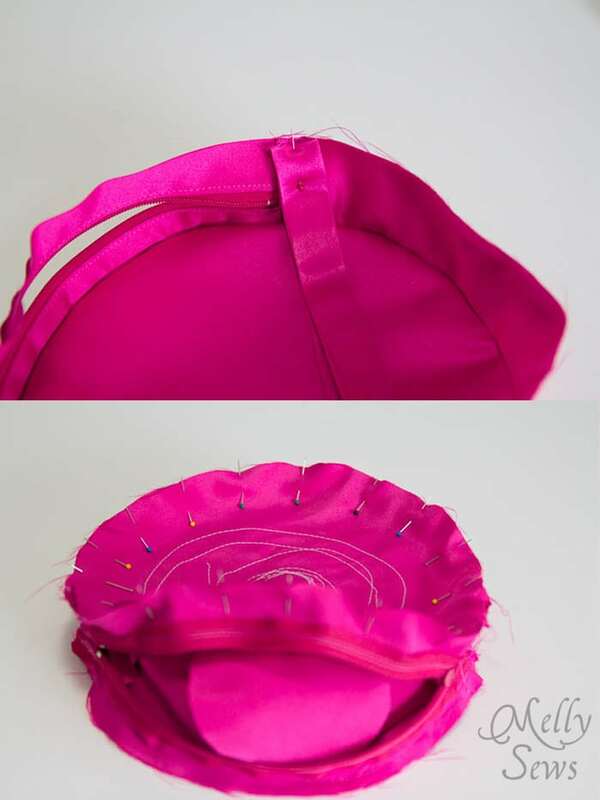 After sewing around the circle, remove pins and stitch the short end of the band to the zipper. Make your wrist strap by sewing the 3 by 16 inch rectangle into a tube, right sides together, turning right side out, and pressing. 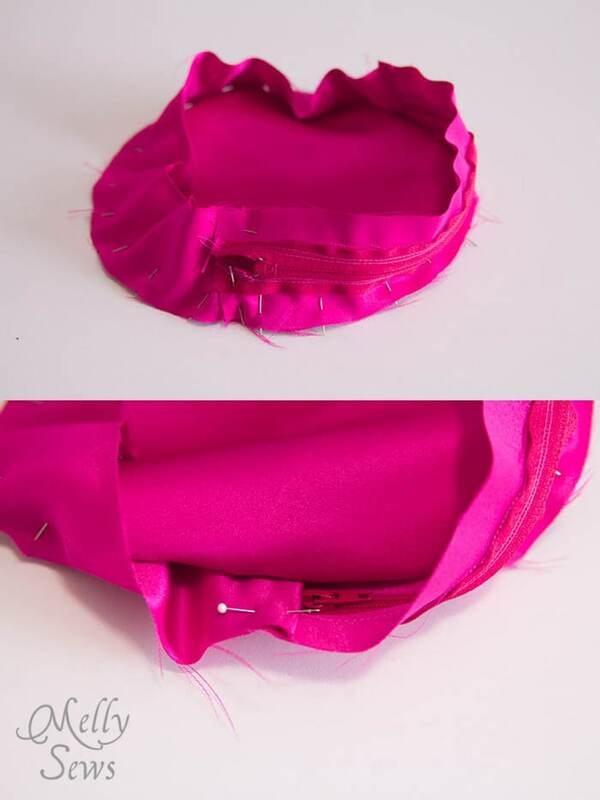 Fold the strap in half and pin to the zipper band at the pull end of the zipper. Then unzip the zipper. 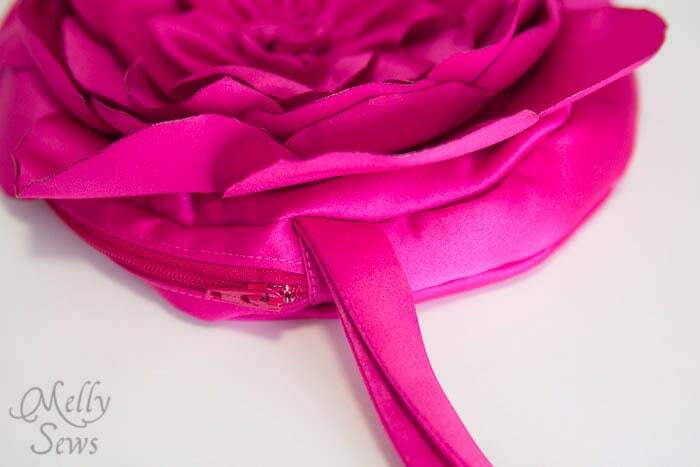 Place your petal circle with the petals inside the clutch, and pin around the circle attaching it to the zipper band. Make sure the petals do not get caught in this seam. Stitch. (Also, that picture above looks like the pouch is sticking its tongue out at me. Am I the only one that sees that? It’s like the Rolling Stones clutch or something). Turn your pouch right side out. You can see below how the wrist strap gets caught in the seam. You may want to seal the edges of your seams with the candle heat to prevent them from fraying, or you may wish to serge or otherwise finish those seams. I went with more fire. Now schedule a dinner reservation so you can dangle this beauty from your wrist. Thank you for sharing this. I bought my sister and niece one like this and was so sad to give them away, as I wanted to keep them! Now I can make my own! Thank you! gorgeous!!! I love this little bag so much, I’m a little nervous about playing with fire in my house filled with toddlers though – but the candle idea is genius! Wow! That is SO cute! 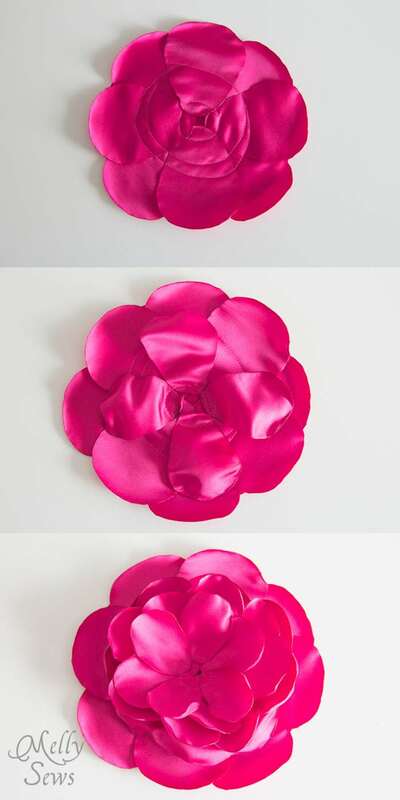 I haven’t had good success with melting petal edges, but I think your point of a heavy fabric might make the difference! Beautiful! And it does look like a tongue. Haha. Super cute bag. Heres a tip for those that want to try it out that I learned a few years back: Go ahead and use fire. I thought I had come up with a brilliant idea to be safe by using my hubby’s soldering iron instead of an open flame. I thought I could cut and burn at the same time with the tip of the iron, wich is correct, but it was so slow and I gummed up the iron so much hubby couldn’t use it any more on his computer boards. Live and learn, right? I love it! This would be fabulous for a formal dance (for my oldest daughter). To be able to teach my girls that these things can be made and they don’t have to buy everything at the store…. what a priceless lesson. I bet they will want to make the flowers for their teachers for Valentines day. Thank you SO much for sharing this tutorial with us. I have been wracking my brain trying to think up the perfect gift for my teen-aged grand daughter for her birthday this year. This will be absolutely PERFECT!!!! I can’t WAIT to get started on it this weekend! Looking forward to making this for my little neice! Do you think duchess satin would work as well as normal satin? Thanks so much for the amazing inspiration!!! !